Concrete slabs are vulnerable to sinking over the years and can cause a host of problems, from water pooling to safety hazards. The following content is created in consultation with Perma-Seal. It does not reflect the work or opinions of NBC Chicago's editorial staff. To learn more about Perma-Seal, visit Permaseal.net. If you don’t know what concrete raising and leveling is, you’re not alone. But you are missing out. Concrete slabs, a common structural element both inside and outside the home, are vulnerable to sinking and settling for various, frequently unavoidable reasons. Concrete settlement is when concrete slabs start to sink and crack, forming an uneven foundation. 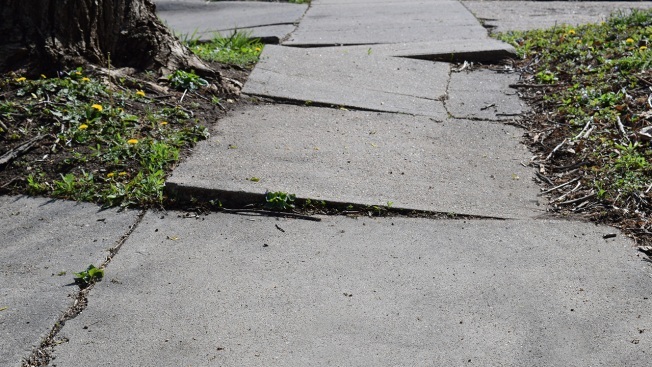 Beyond presenting an unattractive appearance, uneven concrete causes water to pool, creates trip hazards, and impacts the value of a building or home. It is a challenging problem to fix, but fortunately, concrete raising and leveling presents a neat solution. While mudjacking or slabjacking is considered an alternative to concrete replacement, this intrusive process involves pumping a mortar-based material underneath the slab. Traditional mudjacking can present new problems, because the weight of the mixture pumped beneath the slab paired with the weight of the concrete can cause the slab to sink further. When concrete sinks or settles, it’s a result of already unstable soil, so with this added weight, the soil may be unable to support it. PolyLevel™, a patented foam that’s injected beneath the slab, is a less destructive alternative to other methods and can be used for basement and garage floors, driveways, footings, patios, pool decks, sidewalks, and office or warehouse floors. PolyLevel™ combines the proven technique of concrete lifting with a carefully engineered expanding foam that literally levels the concrete and raises it without replacing it. Why does concrete settlement happen? When soil beneath a concrete slab dries and shrinks, it creates space below the concrete, causing the slab to sink and crack. If plumbing lines beneath concrete slabs begin to leak, the soil underneath begins to wash away. The soil is unable to support the concrete slab, which then begins to crack and settle. Washout is often only detectable once the concrete slabs start to crack. During construction of a house or building, soils are moved around to meet a desired grade level. However, after construction, footings might reach below the fill soils while the slab is on top. If the fill soils are not tightly compacted, they will consolidate under the weight of the slab, creating empty space and causing the slab to crack and settle. Increased moisture in the soil below the slab can cause the clay soil to expand, which pushes the concrete upward, resulting in cracked and uneven concrete surfaces. It’s lightweight, and won’t add extra weight on top of the already unstable soil. It’s waterproof and eco-friendly, which means it won’t wash away over time. Requires a small injection hole the size of a penny, which are much smaller than what is required by mud or slabjacking. It has a quick cure time, and can be driven on only 15 minutes post-installation. It has a high capacity lifting strength – up to 6,500 pounds per square foot. PolyLevel™ is one of the most effective methods for fixing concrete settlement, which is why Perma-Seal exclusively uses it to repair uneven concrete. For a free inspection, call Perma-Seal at 800-421-7325 or visit Permaseal.net.